Neonatal immune neutropenia is observed in rare cases in newborns from mothers with idiopathic or autoimmune neutropenia, secondary to passive transfer of maternal granulocyte auto-antibodies. We performed a literature review and report four supplementary cases from the French registry of neutropenia. Only 14 cases (11 mothers, 14 newborns) have been reported. Granulocyte aggregation (GAT) and granulocyte indirect immunofluorescence test (GIFT) are the recommended laboratory procedures for antibody detection. 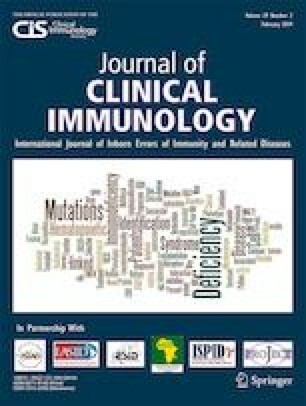 Monoclonal antibody-specific immobilization of granulocyte antigens (MAIGA)-confirmed antibody specificity. Antibody detection in newborns is not generally possible owing to extreme neutropenia. In half of the cases autoantibodies against neutrophils (AAN) were positive in maternal sera (7 out of 11). In some newborns tested, IgG+ AAN were also positive, with disappearance in parallel of spontaneous neutrophil count improvement. No correlation between maternal type of AAN and titer and neonatal neutropenia can be established. Neutropenia resolved spontaneously between 2 weeks and 4 months. Infections in newborns were observed in 43% of cases, with no deaths reported. Granulocyte colony-stimulating factor (G-CSF) was administered to some newborns (5 out of 14) in the case of infections. Low-dose G-CSF administered to childbearing women during pregnancy could be proposed to prevent neutropenia in newborns. From the few cases reported so far it is impossible to draw any conclusions regarding frequency, risk factors, and outcome, but the overall prognosis for newborns seems good. Because it can be associated with potentially severe neonatal infections, autoimmune neutropenia in childbearing mothers should be closely monitored in collaboration with gynecologists and pediatricians.